The Lakes Environmental Association is dedicated to protecting the waters and watersheds of Western Maine. One of our major tools is comprehensive water-testing. LEA monitors the water quality of 40 area lakes with the assistance of a cadre of volunteers and financial support from six communities: Bridgton, Harrison, Denmark, Naples, Waterford and Sweden. Before testing begins, we first need to get out on the water. For most of the sampling season, LEA relies on lakefront landowners for access to the water and boats. These gracious property owners allow us to make the most of our time, reduce travel costs and help ensure that we are not moving aquatic species from one waterbody to another. Once out on the water, we begin by paddling or boating out to the deepest part of the lake. This is where a full profile of the water column can be attained and the influence of day to day weather fluctuations is diminished. After lining up with known references on the shore or going to a GPS marked waypoint, several depth readings are taken using a handheld sonar depth finder. Once adequate depth is found, the next step is to anchor, which prevents the boat from drifting in the wind or moving with the current. 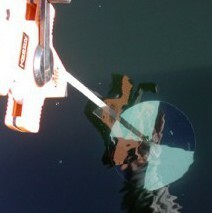 After documenting weather conditions, date, and time of day, a water clarity reading is taken using a Secchi disk. This is an eight-inch round disk divided into quarters that alternate between black and white. This disk is slowly lowered into the water on a metered tape while a monitor watches it closely through a view-scope which cuts out overhead glare. When the disk completely disappears, the tape is pinched at the waterline to get a reading. Clear lakes give deep readings while turbid, tea-colored or highly productive lakes give shallow readings. Next, a temperature and oxygen profile is taken. This is done with a hand-held electronic meter. 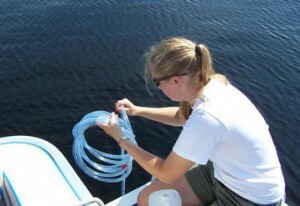 Readings are recorded every meter from the surface to the bottom of the lake. The temperature profile shows the lake stratification and can also indicate whether there is suitable habitat for coldwater fish. 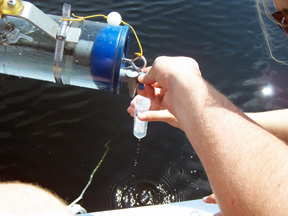 An oxygen profile can show at what state the lake is, how much biological activity is occurring and whether or not the lake is at risk for internal phosphorus recycling. From the temperature and oxygen profile, the depth of the core sample is determined. The core sample is simply a composite sample of the upper, sunlit water where photosynthesis is occurring. The “core” is taken with flexible tubing that is lowered slowly into the water column, sealed and then brought back up. From this composite sample, individual water samples are taken for phosphorus (the nutrient that controls algae growth), chlorophyll-a (the green pigment found in plants), pH, alkalinity, conductivity, and color. During the month of August, individual grab samples are also taken at discreet depths. This is done with a Van Dorn-style sampler that can be closed at specific depths by using a weighted messenger. These grab samples are taken to determine whether phosphorus is being recycled into the upper waters from the sediments. Water quality reports for each lake are available in LEA’s water testing report or on each lake’s individual lake page.